Meaning, I didn't drop anything important today. We had three more cakes to finish today and spent the bulk of the day making garnishes. We made caramel-dipped hazelnuts. And chocolate curls. And bubble sugar and eruption sugar. That was pretty fun! First off, we made the lime mousse for the Spring Passion cake, which was the red and green themed cake we started yesterday. 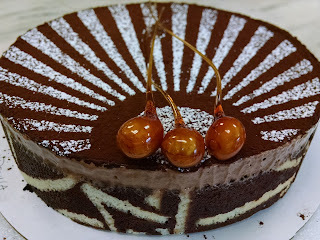 Once the layers were arranged for that one, it went back into the freezer and then the chocolate praline mousseline for the Success cake was prepared. This was pralines, pastry cream, butter cream, and chocolate. It's like Nutella but much lighter (and better). Then that cake was assembled, using a joconde with pâte decor, the mousseline, and the success meringues. We had tons of these so made 12 regular sized cakes and a bunch of tiny ones. These all went into the freezer as well. Next we garnished the Charlotte Helena cake we mostly completed yesterday. This is the one with the ladyfingers around the outside and the chocolate mousse and pears. 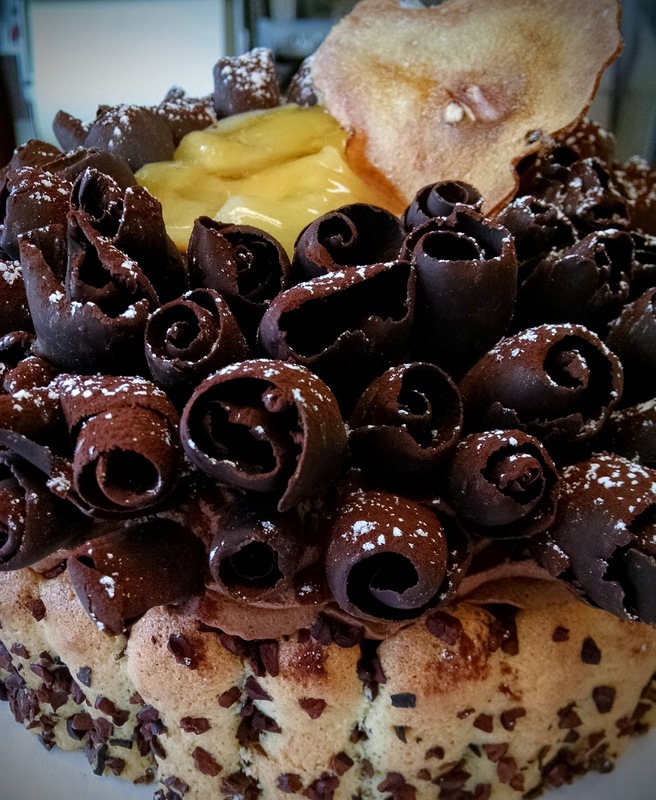 Pears were placed on the center of the cake and glazed and then the chocolate curls were used to cover all the mousse. It was finished with cocoa powder and powdered sugar. Back in the freezer after being photographed and boxed. The Success cake required cocoa powder and powdered sugar as well, and we had those caramel-dipped hazelnuts for garnish. Again, stored in the freezer until it was time to go. 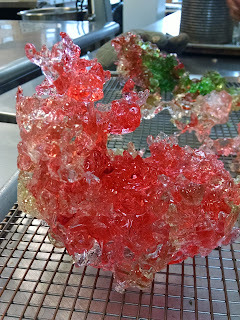 Then we played with the sugar. Both bubble sugar and eruption sugar require the same ratio of sugar, water, and glucose syrup, boiled to 160˚C. At that point the preparation differs. 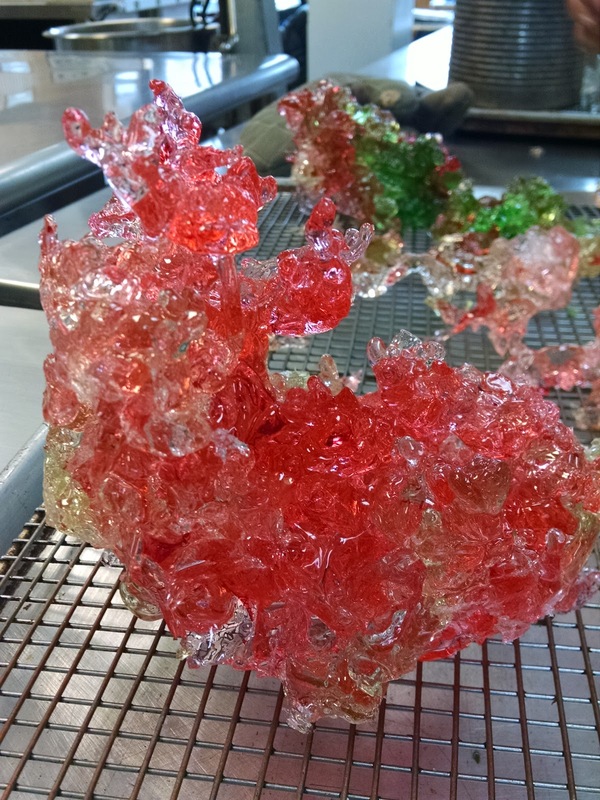 The bubble sugar is poured out over a hot sheet pan, which creates the bubbles (food coloring added after pouring), while the eruption sugar was colored with red and green food coloring and poured into number 10 cans filled with ice. The cans have no tops or bottoms and the sugar hardens and melts the ice. The sugar takes on really neat shapes this way. 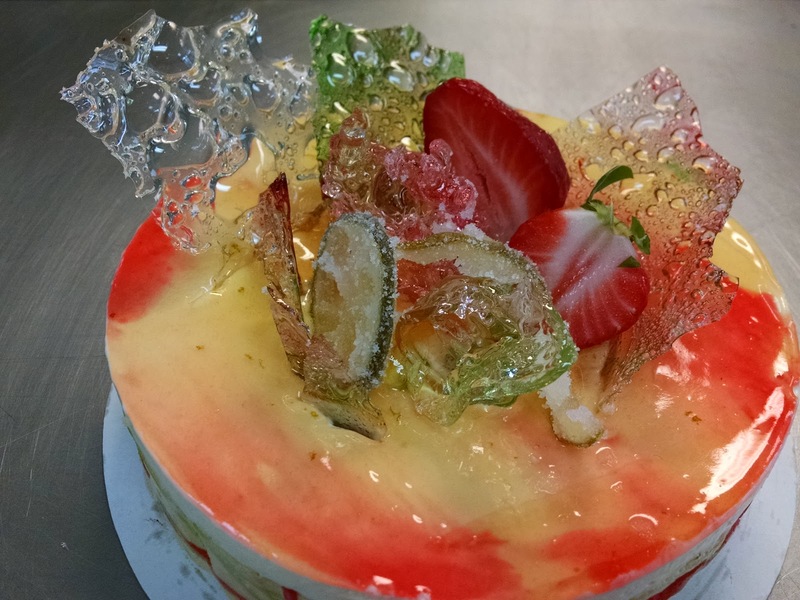 Lastly, we decorated the Spring Passion cake by glazing it with lime and strawberry glazes to create a smeared effect and then adding pieces of the sugar, strawberries and candied limes. 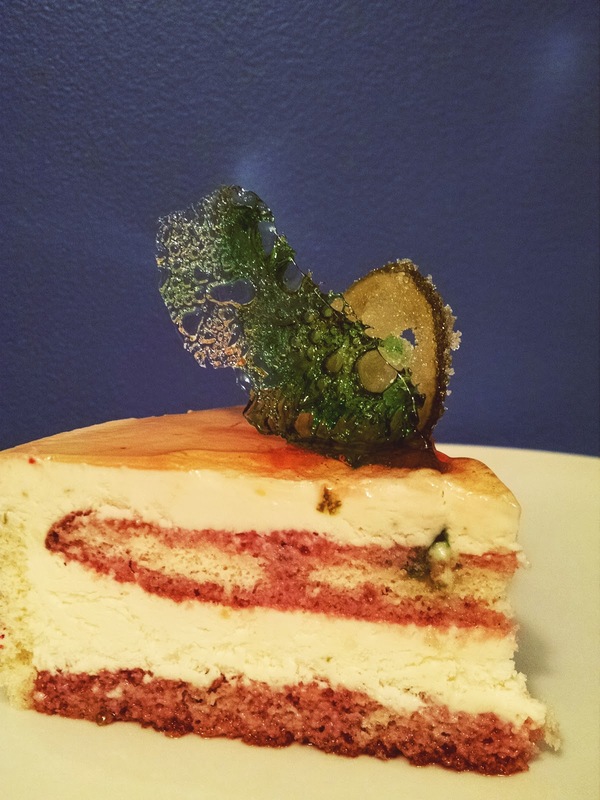 Tonight we ate some of the Spring Passion cake. It's a terrific combination, lime and strawberry. Tomorrow we'll try something else. So many choices!